The heart of Camp William Hinds is the quality, once in a lifetime program we offer each week during the summer. Our program is diverse with something to challenge every Scout of any age and of any interest. 1 - For our First year Scouts (those who have just crossed over) our POLARIS program will provide a wonderful beginning to their Scouting journey. This exciting program will introduce the new Scout to the skills of Scouting and will allow new Scouts to complete many Tenderfoot to First Class rank requirements as well as earning their first merit badges. Highlights include an ice cream social, overnight, and a hike up scenic Rattlesnake Mountain! 2 - For returning Scouts, our Traditional Summer Camp Program will provide a multitude of opportunities. These Scouts who are in the middle of their Scouting career can earn merit badges, gain leadership skills, build troop unity and develop advanced Scouting skills and experiences. 3 - For the Older Scout we have made several additions to our selection of badges and afternoon programming. 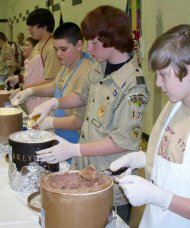 Older Scouts can choose from opportunities such as these. The number in parentheses is the minimum age required to participate. • (14+) COPE program (Challenging Outdoor Personal Experiences) learning teamwork and advanced leadership skills while getting to experience a high adventure thrill on our high ropes course! • The Scuba (13+) and BSA Lifeguard (15+) program will keep them on or below the waves all week. 4 - Pine Tree Council Treks. Our week long Treks will challenge any Scout. Have an older Scout that is bored with summer camp? See if they are interested in this challenge. This is a provisional program so Scouts can do this without leaders. 5 - Have a Scout that you would hold up as an example to your troop? Have a Scout that loves to lead the way and teach younger Scouts? The Counselor in Training (CIT) program is likely a great fit. In this 3 week program a Scout will get to attend camp for a week as part of the provisional CIT troop. Week 2 will be spent learning to teach and lead younger Scouts while mastering some new skills. Week 3 will be a week of internship and mentoring spent with the Camp Hinds staff. This is a great opportunity for aspiring staffers and an amazing value for 3 weeks of camp. We hold a meeting at Tabor Retreat for all Scoutmasters and Senior Patrol Leaders at 1:00PM on the day of your arrival. All Scoutmasters and SPL’s are expected to attend. No one will be allowed into camp until 2:00PM. This meeting is intended to give you the opportunity to bring in all paperwork for camp that was not mailed in ahead of time or submitted online. This includes Med forms. This is your opportunity to sign up for your troop rotation activities. Please bring two copies of your troop rosters. We need this information so we can assign you appropriate table space in the dining Hall. We will also provide you with information about any new programs that we added after the guide was posted, any changes to policy, and we will answer any questions you may have. Scouts should arrive at the Camp Hinds parking lot (not the parking lot on Plains Road but the one in camp) just prior to the gates opening at 2pm on Sunday. Once there, troops will be greeted by their campsite guide, who will accompany the boys, parents and leaders to their campsite. A vehicle pass will be given to each troop to enable all gear to be brought to the campsite. Vehicles without a pass will not be allowed into camp. Once the unloading of gear is complete, vehicles need to be moved back to the parking lot. Each troop is allowed a trailer with gear to remain in the campsite. to fax or email the form to camp. See page 14 for more details. Leaders will receive a packet at the end of the Friday night campfire with your advancements reports, troop photos, and med forms. If you need to leave before the campfire, you may stop by the camp office at a later date to pick up your packet. Packets not picked up will be mailed out after August 21st. A representative of each troop is asked to check-in with the Camp Director to settle your account before noon on Thursday. Please bring cash or a check to pay off your balance due. Camp patches will be issued when your troop is paid in full. We strongly request that all troops join us for the Friday night campfire. If you have a long trip home, you may stay overnight. A continental type breakfast can be provided upon request. There is a phone located at camp for business and emergency use while camp is open, July 1st - August 19th. The camp phone number is (207) 655-6766. Remember, there is no phone next to your son’s tent, so parent’s should only use this number in case of an emergency. We strongly encourage parents to keep their Scout’s cell phone at home & all leaders to keep their Scouts away from phones during the week. Experience has taught us that this really helps with homesickness. We also encourage parents to get the cell phone number of your troop’s leaders in case you need to get in touch. Scouts enjoy receiving mail from home during their stay at camp! We encourage you to write, but be sure to write early in the week as even though mail is delivered daily, sometimes it can take a day or two for mail to reach camp depending on your location. Each campsite has a mailbox in the Trading Post for mail and non-emergency messages! Leaders, please check your mailbox a couple of times each day for incoming mail and messages. All emergency messages received in the camp office will be delivered immediately to the adult leadership of the Scout by the camp staff. Our preferred method of registration is through our online portal located at https://scoutingevent.com/218-2019BSHinds. This can be done as you register your troop. If you are not ready at that time you may log back in to sign Scouts up for specific merit badges at a later date. 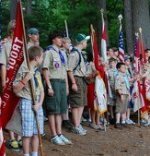 Scoutmasters and Scouts in Provisional will be able to log in an add individuals to the roster, sign Scouts up for merit badges and sign older Scouts up for older Scout programs. Registration is a first come – first serve system and those who register early online will be given preference. If internet access is an issue, please contact Council or camp (when in season). If registration must be done via mail, it is strongly suggested to send registrations in to camp no later than two weeks prior to camp. Please note that registrations mailed in will not be addressed until staff arrives at the end of June. Forms received late will be handled on your Sunday arrival day or Monday morning. If your unit has preregistered with us, leaders will get a copy of their Scouts’ signups at the Scoutmaster and SPL meeting at 1:00pm on Sunday. This will give them the opportunity to make a final check of what their Scouts are enrolled in and make final changes or correct errors. The office staff will provide you with master and individual schedule printouts for adult leaders and Scouts by the Sunday night campfire. If you find problems with Scout schedules, please come to the camp office. Changes can be made before 5PM on Sunday or after 8:00AM on Monday. When leaders receive their proof copies on Sunday, they may notice blank and moved slots in Scouts’ schedules. While we do what is possible to accommodate your Scouts’ requests, they may not always get what they signed up for. Some classes have size limits that are dependent on equipment; others cannot operate when there are too few people because of youth protection guidelines. Scouts may need to be moved to a different time slot of a particular activity to offset large differences in class sizes. Some merit badges require special equipment (fishing reel, musical instrument, etc.) While the camp has some equipment, a Scout will increase his learning opportunities by bringing his own from home. Please label any items brought from home. The camp is not responsible for lost or damaged items. Merit badge pamphlets may be required for a class. We recommend that Scouts utilize their troop library or purchase them from the Pine Tree Scout Shop ahead of time. There is a selection of merit badge pamphlets at the Trading Post, but only in limited quantities. Camp Hinds uses a report generated by Scouting247/Black Pug to report all work done in camp. Completed merit badges will be recorded and kept in the records at Camp Hinds. If you are missing paperwork, please contact the camp office before August 21st. After camp please contact the Pine Tree Council Offices at 207 797 5252 to request any copies of missing merit badge paperwork from the summer. Leaders will receive a packet at the end of the Friday night campfire with your advancements reports, troop photos, and med forms. If you need to leave before the campfire, you may stop by the camp office at a later date to pick up your packet. Packets not picked up will be mailed out after August 21st. Prerequisites: Many merit badges, including most of the Eagle required ones, have requirements that Scouts must complete before attending summer camp. If those requirements are not completed or the Scout does not bring documentation that the requirements were completed, the Scout will go home with a partial. See here for details. Partials: Partials are given when a Scout does not complete the prerequisites before camp, is absent from class, their work is not passed in, or the work is not to expectations within reason. Staff will try to inform leaders if their Scouts are having trouble completing the required work. It is important for leaders to check with Scouts throughout the week to make sure their assignments in and out of class are being completed. Staff is prepared to work one-on-one with a Scout in the afternoon or evening, if they need extra time or extra help. If the week is over and requirements are left undone the paperwork will reflect a partial so that they may come back and finish only what was not completed to a Counselor in their troop or at another week or season of camp. If a Scout does take advantage of another week or comes back for another season they must bring a copy of the paperwork that was released at the end of their original week to the makeup counselor. Hinds does keep records up to a certain date but if paperwork is lost by the unit we cannot guarantee that we can recall the records quickly or at all (they are stored off campus) after a season is completed. If a partial is to be completed after camp, you will need to find a local merit badge counselor to sign off on their paperwork (talk to your Scoutmaster or Troop Advancement Person). There is something for everyone in the evenings at Camp Hinds. Scouts may choose to take a merit badge and work on advancement. Areas will be open for additional merit badge help or to stop by and do a favorite activity. Scouts may come and go from one area to another with a buddy. Areas open at 7:00 pm and close at 8:30 pm or dusk, depending on the area. Each area will have special programs that they will be offering. Check with your Senior Patrol Leader for more information. Blastcar is a CO2 powered car for Boy Scouts. Blastcar is similar to a pinewood derby car in that the scout gets a pine wood block, 4 wheels and 4 axles to build a car, but the similarity stops there. Scouts can use their knowledge to experience the engineering design process through sketching an idea for their racer, laying out a design, constructing the car, conducting trial tests, modifying their design, and adding finishing details. Scouts design their racers for optimum performance on the course. Monday: Scouts work on the design phase. Staff will rough cut the cars for Tuesday evening. 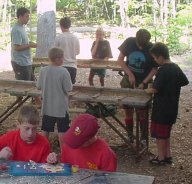 Tuesday & Wednesday: Scouts will finish car construction – shaping, painting, adding wheels, etc. Scouts may drop-in for one, two, three, or four evenings. Scouts will experience various coding activities from graphic based to text based to program a Sphero or BB8 robot. Beginners can give robots commands by drawing a path in the app for their robot to follow. Intermediate coders can utilize the familiar block-based drag and drop interface, while pros can use text programming and write their own code. 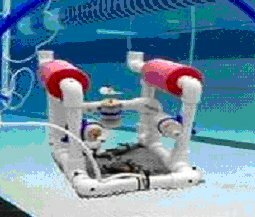 SeaPerch is an innovative underwater Remotely Operated Vehicle (ROV). Scouts may drop?in to get hands?on experience “driving” the SeaPerch. The amount of time each Scout will be in control will be determined by the number of Scouts who show up. dinner on Sunday night. Everyone in camp must attend. planning and will get more information at the daily SPL meetings! Are you an early riser? Say “hello” to the day – and our aquatics staff – by jumping into chilly water every morning for the Polar Bear Dip. If you need a pick-me-up that coffee can’t supply, or are up for a crazy challenge, report to the waterfront at 6:30 am Monday through Friday where you will plunge, splash, or dip into Panther Pond. For those brave enough to attend four mornings, the honor of being able to purchase the Polar Bear Dip patch will be theirs. This is a rugged swimming challenge for all campers and leaders who want to test their endurance. Swimmers swim Monday through Thursday at 7:00 pm. Participants must attend ALL the mile swim sessions. Completion cards will be given to all who complete the challenge and a patch can be purchased at the Trading Post with proof of completion. We know some conflicts can occur, for example, maybe your are taking Fingerprinting on Tuesday. Talk to our Aquatics Director to schedule an alternate time to do your laps on Tuesday. 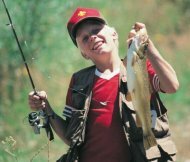 Scouts may go fishing with a buddy during open areas. A favorite spot is along Tenny Point or try our fishing docks! Want to fish from a boat? 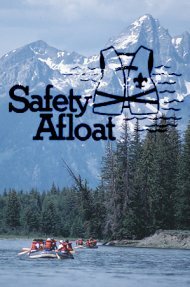 Scouts may only fish from rowboats during troop boating or open boating times. Fishing is not allowed off the Tenny Bridge or in the swimming or boating areas. Wading is not allowed while fishing at any time. Want to challenge the staff to a friendly game of Frisbee or play water polo with another troop? Volleyball, soccer, basketball, baseball, badminton, ultimate Frisbee or your troop's favorite sport are available during your week at camp. Stop at the camp office to check on availability of equipment. The zombies of 2016 are still lingering around camp! Join us for a morning run to escape the brain eaters! Meet at the dining hall at 6:30am. See if you are the best at Camp in these games or make a tournament of your own. Stop by the Office to sign up. Tournament playoff rules will be posted at Camp. Campers will need to coordinate a time to play during open areas and report the results to the Office. A Duty to God Scout Service will be held on Sunday evening following the waterfront orientation in the council ring. Troops may join one of our offered services or plan something for their own troop. If you would like to reserve a camp spot for your service, please stop by the Office. All Camp Offices and Areas will be closed during the Service and we ask that all Scouts observe this quiet time at camp. If this is your first year at camp, as a Scout or leader, don’t miss the sweetest Camp Hinds tradition ever. Join us for some ice cream and a chance to meet the Polaris Staff on Monday evening at 8:30pm in the dining hall. Can you handle pain? Have a distinct style or a big cannon-ball splash? Please join us for the Scoutmaster splash competition. Always a popular event and back by demand! Don’t miss the fun this year - and bring a crowd to cheer you on!! See you at main beach at 8:30pm on Wednesday. Members are encouraged to wear their sashes to Retreat and Dinner. Madockawanda Lodge has several programs planned. A brotherhood conversion ceremony will take place on Thursday nights starting at 7pm. To be eligible, the Ordeal Member must have over 10 months of tenure as well as be a member in good standing (dues paid in full). There will be a small fee attached to cover the cost of the Brotherhood sash. A brief, but mandatory, waterfront orientation for all campers and leaders will be held at the waterfront directly after dinner on Sunday night. Everyone in camp must attend. A brief meeting will be held daily with the Program Director for all Senior Patrol Leaders. Please send a troop representative to this informative meeting if your SPL is not available. Meetings are at 1:00 pm daily at the Rec Hall. Monday at Camp Hinds will be dedicated to Scouting’s other programs: Venturing, Sea Scouts, and Exploring. We encourage all members of these programs who are attending camp to wear those uniforms. We will have special programs in the dining hall on Monday to recognize these programs. For Scoutmasters and adult volunteers at camp. While your Scouts are in merit badge sessions, you can attend Leaders Essential and Scoutmaster training. All training will be provided by our Council Training staff. No need to pre-register. More information will be given at camp. Climb on Safely training will be held for any interested adults. This training is important for any troop leaders wishing to have their youth participate in climbing activities outside of a Boy Scout camp. The training is focused on making leaders aware of BSA climbing policies and procedures so that this information can be passed to facilitators not familiar with the BSA program. This training is also available on-line or with our COPE and Climbing staff at 7:00pm on Tuesday evening. Leave No Trace is the Boy Scouts training on how to perform successful low-impact camping excursions. The training takes 30-45 minutes and will be offered for all interested campers and leaders in the Nature Area at 7:00pm on Wednesday evening.. Participants will receive a card verifying their training at the end of the session. This training is required for troops wanting to do aquatics based activities at camp, including the Tenny River Run. Adults are encouraged to attend this important training at 11:00am on Monday at the waterfront. No swimming is involved. You can also take this training prior to camp online at www.pinetreebsa.org. Please bring proof of training to camp. Don’t miss your chance to sit back with the Program Director and Camp Director and learn from other Scoutmasters. Meetings will be held Tuesday and Thursday mornings at 9:45 a.m. in the new Dining Hall. Trek on Safely is the Boy Scout training for adult leaders on how to perform safe High Adventure activities with their unit. The training takes 30-45 minutes and will be offered for all interested adults at 7:00pm on Tuesday evening at the Scoutcraft Area.. This training is also available on-line. Scoutmaster Merit Badge - Scoutmasters, Assistants, Adult Leaders in Camp!! What do you do while the Scouts are busy with merit badges? Visit the camp program areas and learn what the Scouts are doing. You can check on your Scouts and may even have a chance to help out! You may learn a new skill, you may have a new way of performing a skill, you might just catch somebody doing something great! Have the staff person in the area initial that you visited or helped. Also, attend SM meetings to share in what is going on, upcoming events, and plans for the day. See you in camp! Check the complete schedule for times, dates and locations for all leadership trainings or stop by the Office for more information. At Camp Hinds we want to encourage all Campers and Scoutmasters to do their best, live the Scout Law and fully participate in everything that Camp Hinds has to offer. To encourage individual Scouts, Scoutmasters, troops, and outstanding staff, we have the following awards. Award winners will be recognized at the closing campfire on Friday. Best Troop Award: Show us what your troop can do! Many things will combine to help us decide on the honor troop of the week! Camp inspections, participation in special events like the Zombie Disco theme, Scoutmaster Splash, plus your score earned in the Camp Wide Event will all combine to earn you this coveted award! More information will be given out at the Scoutmaster meeting. Honor Camper Award: At the conclusion of the week, each troop should vote for the Scout that they feel has best lived up to the Scout Oath and Law during their week at camp. Honor campers will be recognized during a meal time as well as at the Friday Campfire. Honor Staff Member Award: Troops can recognize outstanding service in our staff by nominating a favorite staff member at the end of the week. Keep your eyes open for some quality service! Baden Powell Award: Can you work as a team during your week at camp? Every patrol in camp is eligible to work towards this award which includes patrol spirit, advancement, service and living the Scout Law all week. Paul Bunyan, Totin Chip and Firem’n Chit: All three of these awards are available at Camp for individuals or as a patrol activity. Contact the Scoutcraft Director for open times to earn the Totin’ and Firem’n Chits at Camp this year. World Conservation Award: Scouts can earn the World Conservation Award by completing the following merit badges: Environmental Science, Fish and Wildlife Management; or Soil and Water Conservation and Citizenship in the World. Scoutmasters and SPL attend the 1:00pm Scoutmaster & SPL Orientation Meeting at Tabor Retreat. All other Scouts should arrive at the Camp Hinds parking lot (not the parking lot on Plains Road but the new one part way down the road) just prior to the gates opening at 2pm on Sunday. Once there, troops will be greeted by their campsite guide, who will accompany the boys, parents and leaders to their campsite. One vehicle pass will be given to each troop to enable all gear to be brought to the campsite. Vehicles without a pass will not be allowed into camp. Once the unloading of gear is complete, vehicles need to be moved back to the parking lot. Each troop is allowed a trailer with gear to remain in the campsite. After unloading is complete, and the vehicles are parked, the campsite guide will accompany the boys on a tour of camp and to the Health Lodge for a medical check-in. All medications must be checked in at the Health Lodge at this time. As a reminder, it would be prudent for leaders to have copies of all medical forms in the event some are missing. Once the boys and leaders have completed their medical check-ins, they will be given identifying armbands that they are to wear for the duration of their week stay. Following the medical checks, buddy tags will be given and all must complete their swim classification followed by time to get settled into your campsite. A brief waterfront orientation, mandatory for all, will follow the evening meal on Sunday. On Friday, the camp gathers for a sit down lunch, highlighted by the traditional plaque hanging ceremony in the dining hall. Following lunch there is some time to begin the process of packing and cleaning the campsites before the camp wide event which will end at approximately 4:30pm! Starting at 5pm, parents and guardians should begin to arrive and join us for our family Chicken BBQ, retreat & closing Friday Night Campfire! Bring the family for an evening of fun for all! Please note: given the large amount of pedestrian traffic, only one troop vehicle will be allowed in each campsite to haul out troop and personal gear. 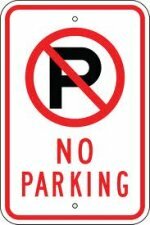 Vehicle passes will be issued to Scoutmasters on Friday. For your safety, when traveling to and from the parking lot all pedestrians are asked to walk the trail to Tabor Retreat and then the Cadigan Road rather than on the main camp road. Meals are prepared by our kitchen staff and served in the dining hall. The camp menu has been dietician approved to ensure that properly balanced meals are being served to the growing young men that visit Camp Hinds each summer. A copy of the camp menu will be posted in the dining hall. All meals except for the Wednesday “cook in your campsite” dinner and the Friday evening BBQ will be served family style. Troops are assigned tables at the dining hall on Sunday by the Dining Hall Steward based on the number of people listed on your troop roster, including adult leadership. Tables are set to hold eight people. Troops are strongly encouraged to assign one adult leader to each table. Some camp staff members may join you at your tables. All waiters are responsible for arriving at the dining hall 20 minutes before each meal. The Dining Hall Steward will instruct waiters in setting the tables for the meal being served. Waiters are the only Scouts allowed to be up during the meal to get seconds and desserts from the kitchen. Waiters are also responsible for staying after the meal to clear their tables and sweep the floor. The Dining Hall Steward will dismiss them from their duties when he or she feels the hall has been properly cleaned. staff) stay at your table. everyone else stay at your table. go to salad bar, etc. BLUE – Waiters may clear their table. All troops will be cooking Wednesday night dinner in their campsite! Troops can cook according to their own personal taste and cooking techniques. Troops can supplement their meal or replace it at their cost. • Tools needed for cooking on an open fire if doing foil dinners. • Cook stove if you prefer not to cook on open fire. As an option troops may want to bring their own food for a special or unique meal or order out from a local business. If your troop is interested in doing more troop cooking in your campsite, arrangements may be made through the Camp Office for in camp meals and through the Camp Director for Outpost trips. Arrangements can be made with the cook for those with special dietary concerns (religious or health based). Please contact the camp at least one week prior to your arrival at camp for special diets so that arrangements can be made and food can be ordered. These meals will be individually prepared for each Scout. The Dining Hall Steward will make a special call when these special diet meals are ready for pickup. Parents and Family are invited to attend the Friday evening activities, including Chicken BBQ, retreat, and closing campfire. Dinner will be at 6 p.m. followed by the Flag ceremony and retreat at 7:15 p.m. and the campfire at 7:30pm. Please stay and attend the Friday closing campfire with your Scout! It’s the culmination of what is the highlight of their summer! The staff will be putting on a show for all of our visitors that your Scout will not want to miss! Scouts and leaders will be recognized. Awards for certain activities completed during the week will be distributed. Chicken BBQ Tickets are available for purchase at the Trading Post starting on Sunday. Tickets must be purchased by noon on Tuesday to allow time for ordering food. The meal will be BBQ Chicken, corn on the cob, tossed salad, potato salad, dinner rolls with strawberry shortcake for dessert. (Vegetarian options will be available)! Campers and leaders in camp for the week do not need to purchase tickets. The tickets are $7.50 for adults and $5.00 for siblings 12 and younger. If your troop is having problems securing two-deep leadership for your week at camp, you should consider sharing a campsite with another troop. Arrangements for this can be done through Camp Director. The troop is responsible for providing adult leadership for its Scouts. Discipline problems are the responsibility of the troop’s leadership, with help from the camp staff when necessary. Feel free to contact the Camp Director with any concerns while in camp. Leaders are responsible for making sure their Scouts receive their medications. Notices will be sent to Scoutmasters for any Scouts consistently missing their medication distribution times. Do you want to take a more active role (either before, during, or after) at Camp Hinds this summer? We would love to hear from you! Get in touch with the Camp Director to let him know. Camp Hinds 2019 Program Kickoff! We strongly encourage ALL Leaders and SPLs to join us at your district roundtables to get your camp questions answered! The meeting is an informational meeting to update Scoutmasters and/or troop camp leaders of the changes and program information for the 2018 camp season. Look for dates and times in Pine Spills. 1 – A member of the camp administration will be at each of the April District Roundtables. 2 – We will host pre-camp orientations meetings at camp on Saturday May 4th - 2:00pm or Wednesday May 8th - 7:00pm. 3 – We will hold a 1:00 PM Scoutmaster & SPL Orientation Meeting on the day of your arrival. All SPL’s will meet daily with the Program Director at 1:00 pm inside the Rec Hall. If the SPL is not available, please send a representative. Troop leaders are invited to meet with camp leadership at the Ring Dining Hall on Tuesday and Thursday at 9:30am. A brief meeting to discuss check out procedures will be held on Friday morning at 9:30am. This is a chance to find out what new things are planned for next year. Camp staff and council representatives will be there to hear any concerns you might have. Please understand we need your help to make sure all of our Scouts have a great camp experience. Camp Hinds aims to make our program available to all campers. If you have a person with a disability that may require special attention, auxiliary aids or any reasonable accommodations, please contact the Camp Director at least two weeks prior to your stay at Camp Hinds. Camp Hinds has long established procedures recommended by the BSA for lost campers, lost swimmers, fires and severe storms. We use a siren as a warning device if and when it becomes necessary to call the camp together. When you hear the siren, all campers, leaders, and guests are to report immediately to the council ring. Please move quickly, but no running. The Scoutmaster needs to take a head count and report “Troop # all present” or “Troop # is missing # Scouts” as the Camp Director takes a troop roll call. The staff may have different roles depending on the nature of the emergency. In the case of a severe storm warning, staff will be informed via the camp radio system. 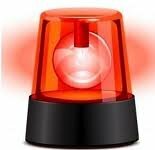 At the sound of air horns, all Scouts, leaders, and staff will seek shelter in the Rec Hall, the Dining Hall, Ring Hall, Cadigan Lodge (if not used for housing), Bates Cabin, Tenny Rec Hall, or the Training Center depending on their location. A roll call will be taken. The camp will be dismissed once an all clear has been given. Because of the many recent mass shooting events around the country, Camp Hinds has added an active shooter/disperse procedure to our emergency procedures. This is a different response to the alarms described above and being mindful of the difference is vital. You will receive official emergency procedure when you enter camp, they are posted on your campsite bulletin board. We will have a drill within the first 24 hours and at that time we will discuss the two types of alarms: “gather” and “disperse” and listen to both so that leaders and Scouts can differentiate between the two. Staff will be well informed as to how to respond to these alarms and what action to take to ensure the safety of all. Camp Hinds has written agreements with local fire, police and medical departments to provide Camp Hinds with the necessary coverage for any emergency. Each troop site has two-man tents on platforms for all of our Scouts and leaders. Bunks with mattresses or cots, picnic tables with tarps, water buckets, a flagpole and a bulletin board are also provided in each campsite. Troops are encouraged to spruce up their campsite with troop flags or banners, cooking equipment and lanterns. Troops may want to bring along sports equipment, paper products, water jugs and campsite games. Getting enough sleep can make a difference between having a great or poor week at camp! Camp leaders should see that their Scouts are in the campsite by 9pm and that quiet hours are observed from 9:30pm-7:00am. A siesta is scheduled for rest time everyday directly following lunch. Everyone should show respect for others within the campsites, by following the quiet hours, assisting with campsites and general camp cleanliness by following the Scout Law. Camp Commissioners will inspect each campsite on a daily basis for cleanliness, safety, conservation, organization and Scout spirit! Troop Inspection Sheets are posted in each campsite. Can your troop have the best site in camp? The top troops will be recognized in front of their peers! A broom, shovel, rakes, fire buckets and a water hose will be kept in each campsite. Commissioners will check daily to see if the camp equipment is there. Equipment that is lost or broken due to misuse will be charged to the unit. There is no need to bring this equipment back to the camp room at the end of the week. Please use care around the campfires in your sites. Only established campfire rings may be used in camp for fires. No liquid fuel may be used to start any fires. No open flames, of any type, are permitted around or in any tent. Full fire buckets are required around your campfire ring. Troops need to fill out and follow the posted Troop Fire Guard Plan found on the bulletin board in your campsite. Hot showers, with individual shower stalls, are available for all campers and leaders. Latrines with toilets and hand-washing facilities are found in each campsite. The camp room is located next to the camp office. Toilet paper, cleaning supplies and extra fire buckets are available at the camp room. A limited supply of cooking equipment and American Flags are also available for units to check out. The camp room will be open daily at 8:00am. Please try to send a representative of your campsite during this time. If supplies are needed in an emergency basis, please check with the camp office. A Scout is helpful and clean! Each day troops are asked to assist in keeping camp clean with a rotating schedule of good turns. Good turns should be completed before 2:00pm. Schedules of good turns are posted in camp! We encourage troops to contact Camp Director during the off-season, in order to find out what camp needs for help and equipment. Troops are always welcome to perform a small service project for camp such as building erosion walls and brush removal! 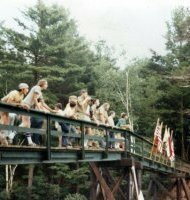 Monday at Camp Hinds will be dedicated to Scouting’s older youth co-ed program called Venturing. We encourage all venturers attending camp to wearing their favorite Class “B” venturing shirt and their venturing uniform to retreat and dinner. Camp will host a special event in the evening to talk about the exciting program opportunities that Venturing offers. Camp Hinds has a long established tradition of wearing uniforms in camp. Our staff is in uniform at all times, unless their job requires something else. We encourage all of our Scouts and leaders to proudly wear the Class A Scout Uniform every evening for retreat and the dinner meal. The 2018 camp t-shirt, hats, etc. will be available in the Trading Post for those that would like to purchase them. A professional photographer will be in camp to take troop photos for those units wanting them. Photos are colored 8 x 10’s. The cost for each photograph will be $10.00. A troop photo order form will be given to each troop at camp. Money needs to be collected and turned in with the order form to the Trading Post by noon on Tuesday. Troops will receive their photos at the Friday night campfire. The day and time of your photo sessions will be scheduled at camp. Pictures may be taken in camp to be used by Pine Tree Council for advertising, marketing or to highlight our programs. Camp Hinds operates a trading post, like a general store. The trading post offers camp t-shirts, hats, sweatshirts, postcards and stamps, souvenir items, candy, soda and toiletries. We also offer camping equipment like flashlights, insect repellent, jackknives and much more! The amount of money that each Scout bring is an individual matter and should be determined by the Scout and his parents. Generally speaking, $40.00 is plenty for a week’s stay. BBQ Tickets are available for purchase at the Trading Post starting on Sunday. Tickets must be purchased by noon on Tuesday to allow time for ordering food. Campers do not need to purchase tickets. The tickets are $7.50 for adults and $5.00 for siblings 12 and younger. Visitors are welcome in camp, but please understand that everybody is on a busy schedule and Scout prone to homesickness may do better without visitors. All visitors must sign in and out at the camp office. Remember that the camp facilities are primarily for the use of campers and leaders. Visitors must purchase tickets for meals, which are available in the trading post. Visitors should limit their visits to dinner & “open area” time immediately following dinner. We ask that all visitors sign out before 9pm. Due to insurance issues, limited space requirements and program needs, younger or older siblings of Scouts are not allowed to stay overnight in camp, even if their parents are Scout leaders in the campsite. They may come as an occasional guest to visit during the week. Program activities are open for Scouts and leaders only unless advertised as a family event - such as the Friday night Campfire & BBQ. Please be aware, there may be some children of the staff that live in the camp for the summer. Pets, sheath knives, fireworks, firearms, ammunition, bows & arrows, radios, CD players, televisions, walkmans, electronic games, cell phones, squirt guns, alcoholic beverages, and illegal drugs. Other valuables should be left at home. Persons under 18 may not have vehicles in camp without prior written approval of the Camp Director. We ask that all camper and staff behavior follow the guidelines and principles set forth in the Scout Law. Negative and inappropriate conduct will not be tolerated. We ask for your cooperation and understanding in helping us maintain a high standard of personal behavior. Mature leadership is vital to the success of a unit’s stay in camp. If your unit’s leaders lack the necessary maturity to safely lead a troop, your unit may be asked to replace the leaders in question or, as a last resort, leave camp. Scouts come to camp for fun, friends, and adventure. Where else will your Scout have a squirrel run through their tent in the morning as they’re getting ready for the breakfast? Where else will they have an opportunity to grow current friendships, and make ones that will last a lifetime? Where else will they discover the best place to see the Milky Way in the night sky? The daily or weekly schedule in camp is only an instrument for planning and administering the program. It is a timetable for certain formal activities and a checklist of opportunities. Arguably fun, friends, and adventure is a big part of Scouting, but it isn’t always found on the schedule. It is found in free experiences or in doing unscheduled or unplanned activities. Ask the Scouts what they want to do at camp. Share a list of suggested activities. Get them excited about going to camp. Find out what the Scouts would like to do together as a troop, as a patrol, with a friend, or on their own. Determine advancement needs. Update your individual advancement records and have each Scout build his week-long program based on his goals. Plan for camp routine. The camp program includes and allows time for camp housekeeping, set up, clean up, and inspections. Learning to live and work together can be a very important part of Scouting’s purpose. Plan for troop programs. Be sure to leave time for the activities your troop would like to do together, including swims, hikes and shooting. Do not be afraid to let the Scouts make mistakes. Mistakes are the seeds that germinate learning and success. Always keep safety in mind! Make your campsite the heart of the camp. Your campsite is your home for the week, so work at making it more comfortable. Try using banners and flags to dress it up. Show troop spirit. Challenge the rest of camp by bringing your troop cheer to camp and show everyone you’re number one! Hold daily troop meetings. SPLs can share important information and give daily recognition to troop members. • Summer camp is not a merit badge mill. They are one portion of the overall program. • Be aware of which badges require the most skill, endurance, or written work, since those will require more time during the week. 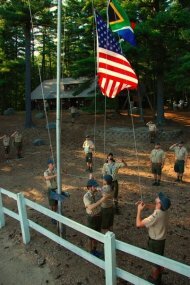 • Merit badge work at camp can be made easier if the Scout does some preparation in advance. Camp is not an ideal place for Scouts to complete written work and Scouts can prepare by completing their written work before arrival. Obtaining the merit badge pamphlet and at least knowing the requirements is a great place to start. • Don’t forget to schedule rest time. Too often Scouts don’t take the time to sit back and enjoy the beauty Mother Nature has to offer. This goes for Scoutmasters as well! As Scoutmaster or adult leader, you have a key role in assisting your troop in executing your planned program and tending to your troop’s needs. Commissioners are available to guide and assist you, instructors provide programs, and food service staff help to make sure you’re fed adequately. • Follow all camp policies. • Distribute troop medications individually. • Monitor Scouts’ behavior and enforce camp rules and policies. • Adults should know the approximate location of their Scouts at all times and be aware of the activities they are involved in. • Enforce the buddy system. Scouts needs to have a buddy in the program areas, on hikes, while swimming, and during other activities. • Monitor your Scouts’ advancement. Spot check attendance and progress. • Empower the SPL to enact and use a duty roster for the week. • Attend leader meetings. Take advantage of leader development opportunities. Explore ways to enhance your year-round program. The senior patrol leader is the key youth leader in the troop. Listed below are the camp duties of the SPL. 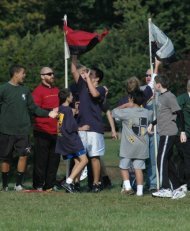 The SPL - not the adults - should be the primary leader for your troop during your stay at camp. • Assist your troop in planning their summer camp adventure. • With your troop leader, attend the pre-camp orientation meeting. • Upon arrival, meet your camp guide and become familiar with your campsite and campwide duties and responsibilities. • Attend daily SPL meetings and relay information and ideas to and from your troop. • Be responsible for your troop’s bulletin board. • Create a daily duty roster and make sure members follow it. • Make daily announcements about upcoming programs and results of campsite inspections. • Be sure your troop members observe times for taps and reveille. As a leader, you know they need their sleep and you must respect your campsite neighbors. 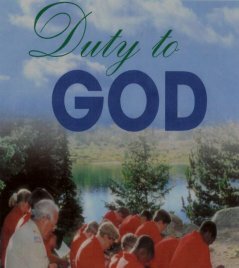 • Be sure your troop completes all camp-wide duties you are scheduled to complete!